When I featured a fake accordion containing a hidden mini-disc player back in June in caused a bit of a stir. What a cheat ! We all thought. We it seems this type of thing is nothing new. 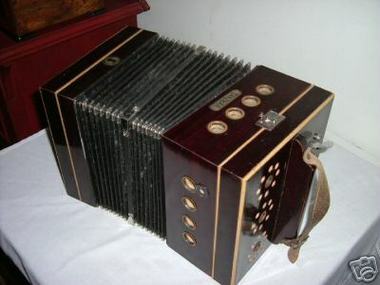 This is a Tanzbar player accordion from between 1900-1930. It uses paper rolls instead of mini-discs and I guess you had to squeeze the bellows to get it to play (let me know if I'm wrong about this bit). 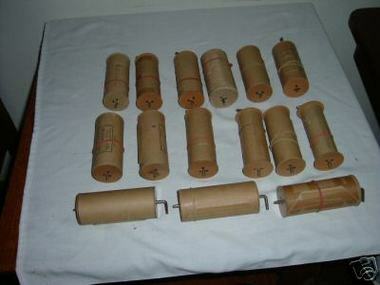 This one came with 16 rolls and sold for exactly $500 US on Ebay (£265). Compare this with the $1595 for the mini-disc player... I know which I prefer. Hi,I was the buyer of this Tanzbär. It was in almost perfect condition, with 16 tunes (rolls) ranging from John Philip Sousa's El Capitan to Donauwellen by Iosif Ivanovici. 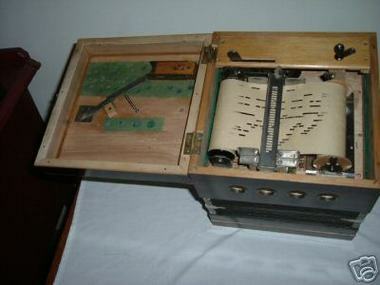 Yes, you have to squeeze or pull the bellows, the sound is made just as with an ordinary concertina. In addition you pull a handle that makes the rolls turn. It is very difficult to keep a steady tempo. The buttons are fake. 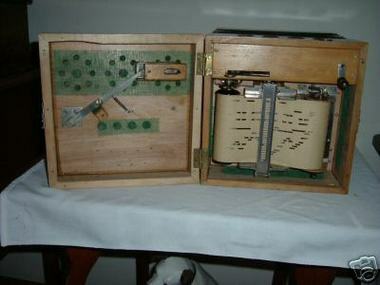 This is one item of my collection of about 150 free reed instruments, including about 30 bandoneons/German concertinas and 6 flutinas/French accordeons. I am a medical doctor, but my hobby is to restore and tune bandoneons. Congratulations with a fantastic blog! I am in the process of making one myself, and I'll come back to you when it is up and running. Wow, great to hear from you Olaf, and thanks for your first hand information about the Tanzbär. I hope you get your blog running soon, I'd love to see some photos of your collection. A friend brought a tanzbar to our monthly Vancouver accordion circle and we all got to play around with it. He opened it up and we got to see the paper music roles and all. I love the fake buttons ("Hope the rest of the band doesn't notice.") and it was hard to pump the bellows while thumbing the lever that spun the music roll on kind of a flywheel thing. Tricky. And then you have to change rolls after each song? Might as well learn to play. Except I guess you could learn the technique once, and then play any roll. Best part of these "player" instruments for me is that they had actual people like Scott Joplin sit and play the machine that punched the paper-holes, so they're actual recordings of the artists who made them. Cool. Wonder who played the one we had? Thanks for the report on what it's like to play with one Bruce. I've only ever seen pictures of them myself. 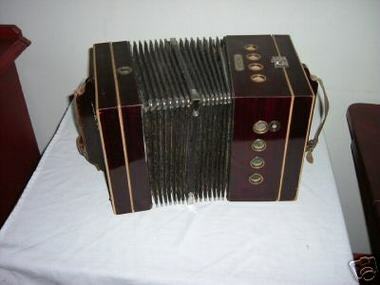 I have a Tanzbar player accordion, wondering wat the worth would be? A lot depends on the condition. The one above was in almost perfect condition, and went for quite a lot of money - but not overly expensive. If it is out of tune, or broken then the value will reduce dramatically. I am the owner of a original Tanzbar from around 1900. My problem is that I do not know where I can buy other rolls since I have only 1. I would be grateful if anyone could supply me with this information. Thanks in advance for anwering. I forgot to mention that the paper rolls my Tanzbar is using has a diameter of 6.3cm, including the reel it is 7.0cm and the maximum no. of holes broadwise is 16. I am very interested to buy a Tanzbar. How is it possible? These are quite rare I think, but there is one on Ebay at the moment in Australia. I have one we recently discovered. It is in good shape and has 6 rolls. Oh my goodness!! We just went through some old family members house cleaning it out and we found one of these. I thought I would just try to google it to see what I could find. What am I to do with this thing? Don't attempt to fix it up, or even clean it. I imagine it would be easy to damage these things. If you want to sell it, then Ebay would be a good choice, although I wouldn't rule out taking it to a proper auction house. Hi,I am looking for a tanzbar in working order ,Iff you have please take contakt. I recerntly bought one of these instruments. It looks like new and has 5 rolls with it. I am going toclean it up and repair one split bellow. I rebuild player pianos so it will be no problem. I have a couple of "player" harmonicas as well. I really collect stringed instruments, but this was so interesting I had to have it! I have just been working of restoring one of these and it's main problem was that the leather and felt pads that close the reeds off, had come unglued from the brass arms that control the reeds. There was a black glue residue, not sure what type of glue was originally used. I scraped off the residue and used traditional white glue , which appears to be holding. To get these pads back in place , I had to remove the reed block mounting board, on which the whole player mechanism is mounted. This was done by removing the wood screws from the edges of this board. Using tweeser and various wooden sticks, I aligned the pads for re-glueing. All 28 were reglued. Once reassembled, a suitable thickness of paper was installed in the tracker bar, to compress the mechanism , and in turn the pads, and then I adjusted the leather nuts so that the pads would seal properly. The mechanism works by using the paper roll to close the reeds unless there is a hole punched in the roll which allows the reed to open. The bellows gives air to the reeds, and the right hand lever drives the flywheel which drives the roll.